What do you get when you cross big juicy red Nagano prefecture apples with apple-loving beer brewers? Second Strike Apple Ale. Tart and zesty in the mouth, Second Strike finishes dry and almost cider-like. 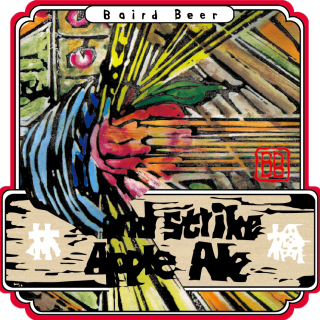 Our beer and baseball loving friends at Harajuku-based apparel maker Alias chose the name ‘Second Strike’ and the artwork reflects this baseball motif – a batter swinging and missing for strike two, only the pitcher is hurling an apple rather than a baseball. The concept for this brisk and refreshing fruited ale, together with the succulent Nagano prefecture apples, was provided by our friends at the Harajuku-based apparel company Alias. In order to highlight most effectively the wonderful all-natural flavors of our Nagano-grown red apples we incorporate only base malts in the grist and we mash long and low in order to maximize ferment-ability and achieve high attenuation. This renders the beer dry and a touch cider-like in the finish. The hopping is low and neutral so as not to interfere needlessly with the subtle apple-fruit character. We add the fresh apples, sliced and minced, to the wort twice (once during the boil and once in the whirlpool) and to the green beer once (in the conditioning tank before packaging and secondary fermentation). It is the use of whole fruit, not extracts or frozen purees, which makes all the difference when brewing fruited Ales and Lagers.